I’ll tell you: USING them each day is the best. Often, when I start my work in the morning, I reach behind my desk and sight unseen, I pull out one of these Wands from the set, and then I live and love with that energy all day long. Sometimes they help me to release toxins (Liver Support) and sometimes they offer me truly deep breaths (Respiratory Support). Whatever is needed is what appears……….. Listen to these Wands. They have stories of healing to share with you. All things upon this beautiful planet are made of: Fire, Earth, Air, Water, and Ethers. The Elementals are the Devic guardians of these five Elements. Each day, according to our needs, these Elements and Elementals change and grow within us, keeping us balanced so that we can do and be the wonders that we truly are. 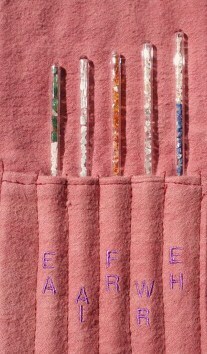 By listening to the Elementals and the Stonespirits, we co-created these five, wondrous Wands. Each one comes to you with their own, unique words (a listening) from their hearts and Spirits, to share with you how to use their precious gifts in your life. Hold them while you create your dreams. Place them upon your body, to align your meridians. Use them in your own, respectful rituals. Lovingly charge your food and drink with them. Place them over your most precious affirmations. Keep them next to you while you sleep, for guidance and regeneration. Place them over your eyes to quiet and then revitalize your mind. Listen. The Elementals will guide you, just as you wish. It is our deep honor to share these profound, glorious Elemental Wands with you. 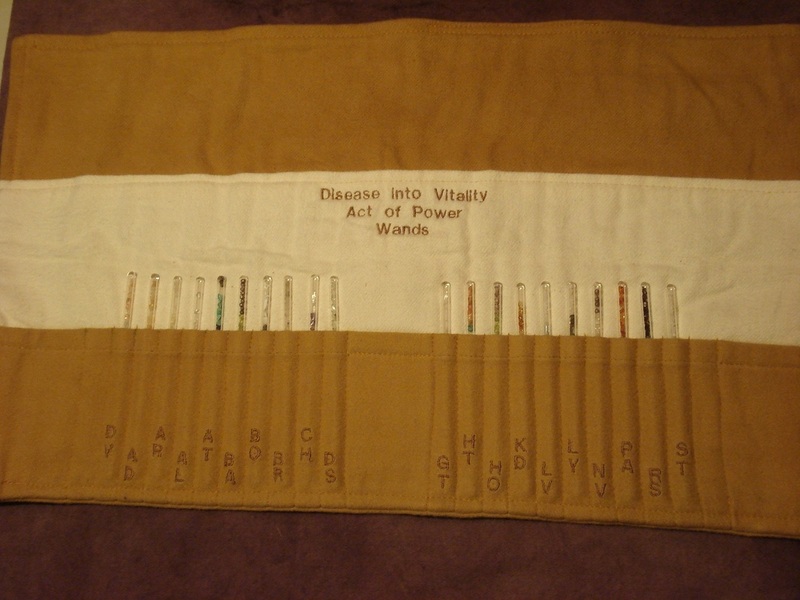 This Wand Set is used in as many different ways as you can dream up. It is used by Astrologers, and by private individuals who want a focused, physical way to practice and embody on a deeper level the Planetary cycles we all live in and are affected by. 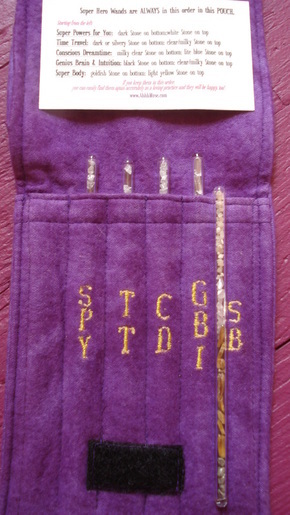 Again, this Set comes with an Organic Bamboo fabric Pouch that is embroidered to help you maintain and keep track of the individual Wands. I love, use, and give LOUD thanks for every single tool here that our Spirits generously co-create with us. They each bring multiple dimensions of brightness, joy, activation, healing and inexplicable *alchemy*! However, I (Marilyn) must confess. I am not a totally impartial mom. So far, I love the Planetary Wand Set, best of all! (Don’t tell the others!!!) They urge me to literally, (graciously) embody the biggest picture possible, in my every act. After all, what gives us the most immediate opportunity to clearly, willingly— even quantum leap— evolve this second? Perspective. When we can see and feel that a way of being is the perfect way— the way that ultimately rewards us for being divine humans, why would we ever choose anything else? That’s how I receive the gifts from the Starfamilies and the Planets. Every night, they grace me with a bigger picture; they lift me right out of my stuck-on-myself, can’t-see-the-forest-for-the-trees realitybox. They inspire me with something brighter— something that smiles at me even when I’m too stubborn to admit I desperately need a smile and a hug. When they freely radiate their brightness upon all the children of the Earth (WOW! ), they remind me: I AM a cosmic citizen. I AM a child of the universe, and I have things to do here on the Earth Mother that can make me smile every day no matter what. No matter what. Holding the Planetary Wands gives me all that and MORE. Why more? Well, it’s because every day that those Wands transmit their magic into my beingness (with my free permission) I grow. I evolve beyond myself and beyond the small-logic-parameters, whose importance I exaggerate periodically. In every, next moment, I am infinitely different and therefore can now receive something different and more from the Planetary Wands. Chiron: It’s always about healing, especially healing places that I couldn’t find before. Earth: Thank you, Earth Mother for giving me a home where I can act upon my Spirit now. Full Moon: Always looking to the light, and even aiming for the brightest light. Jupiter: Belly laughs! These are particularly useful when my ego is red-hot mad! Lunar Eclipse: Don’t go PAST your feelings, until you have honored them/you/the world by feeling them and letting go of judgment. Lunar Nodes: Unknown territory awaits me and if I go there, freely, I will evolve. I am the captain of my soul, the master of my destiny. Mars: Do it now. What are you waiting for? Mercury: I LOVE learning! Anything. Everything. Moon: Nurture yourself. Everything is provided. Neptune: We are one in ways that we cannot think of yet. So feel it; act upon it. New Moon (That’s TODAY, as I write these words!!! ): Every beginning is a birth in the universe. Everything is possible, now! Noonday Sun: Look at all the gifts I can offer. I’m radiating them all over the whole world. Pluto: I am really scared AND that is never going to stop me. Rising Sun: I am a co-creator upon the Earth Mother. Saturn: I listen to everyone else, because everyone is my teacher. That’s why I’m meeting them here and now. Thank you. Sedna: I will evolve. I’m going to RELAX into that right now. I’m insisting on relaxing into evolution right now so that I can simply, easily, graciously absorb ages of learning right now. Setting Sun: Peace. I remember I AM peace at the core. Solar Eclipse: WOW! When the Sun comes back out, I’m going to have a new life. Sun: Feeling your warmth shows me how glorious it is when we just give ourselves, in every moment. They literally light my path…..and maybe yours. Trans-Pluto: Beyond here there be dragons…..or unicorns….or seagoats….. Beyond my fears lies such inexplicable magic, there are no words. Uranus: I CAN be contrary or weird— or just unique— and it will inspire something new! Venus: When I give myself over to life and really place all of my presence in my body— in this one, single, perfect breath— the world rewards me 1000 times over. The miracles are big or small, or loud or quiet, but what they always are is constant. They are the constant in my rooted, vibrant body. Thank you for letting me share this with you. I am honored. Shadow Integration: Face the truth of what you are. When you do that unconditionally, you get to re-write everything. Fear, lack and struggle are leaving. Everyday Embracing: You are healing lifetimes of loving and learning. Choose to honor every lifetime and every quality you possess. Insist upon speaking up for every lesson you have bravely taken on. Dreamtime Doorway: In other dimensions right now you are a HERO. You are acting upon that. Speak to that SELF. Integrate it with awe, glee and utterly high expectancy. Act of Power: Every morning breathe in the fullness of your genius. Now expand it to your fingers, your toes, the farthest outreaches of your aura. Sing to your body electric. Talk to the fullness of you so sweetly that you grow it into impossibly magnificent reality. Shadow Integration: For long, people have used their unique voice to limit themselves unnecessarily. Now is the time to remember that you are not a number, an age— you are a natural cycle of Earth evolution. Everyday Embracing: Be still. Enter the doorway of NOW so completely that you are presented with unlimited doorways from there. Dreamtime Doorway: You are many selves; maybe there are more selves than you will ever meet. Expand into that. Pick a Being and become it thoroughly. Once you have known its wonder, move to the next one. Act of Power: Time is breath fully crystallized into consciousness then let go of. It cannot be contained. It has no name until you give it one. Choose carefully. Shadow Integration: Sleep time can be escape or you can transform instantly into deep awareness. Shed your attachment to everything. You will automatically enter multiple dimensions of life and dreams. Everyday Embracing: Every act can bring together body and soul seamlessly. Then it is a ritual. When you make everything a ritual you create parallel realities and insistent miracles. Dreamtime Doorway: Stop clutching fear. Breathe in freedom. Take everything you know and turn it into the unknown. Now you are a Dreamtime Traveler. Act of Power: Every night before you go to sleep, clear your vessel. If you have old hurts and hates, let go of them even if you do not have understanding or readiness. Keep doing this every night, every night, until they let go of you. Shadow Integration: Humans learn everything by endless repetition, often times mindless endless repetition. This reinforces separation. What would you like to repeat with a fully activated magnificent genius brain? Everyday Embracing: What if, in every single breath, you could access every glorious potential? What would you do with it? All of these potentials already lie in wait inside your brain. They are scheduled to awaken now. Start talking to them. Visualize with them. Use them as the fully activated SENSE they have always been and meant to be. Dreamtime Doorway: You know what’s coming next. You know what has come before. You exist in so many times and space. Befriend them. Do it consciously. There is nothing respectful that you cannot actualize. Act of Power: Your brain is a microcosm of the FREE ENERGY that marries the Earth to endless magic. Trust in it. Watch its seasons. Let it speak to all aspects of your reality and transform them knowingly. Shadow Integration: You have been born into separation. You forget that you are more than a body. When you believe this, you are LESS than a body. Everyday Embracing: The magic of your physical senses is that they gleefully transport you into here and now and far, far, beyond it. Breathe beauty into every pranic breath. Dreamtime Doorway: You are pure wonder. You are afraid that this is not so. Yet, it is always true and you unnecessarily fear this as well. Act of Power: Stand tall in your body. Your Spirit designed it exquisitely for every healing. Every cell is dedicated to your holy experiences. Gloriously allow the length, the width, and the depth of you to transport you into strength, stamina, and inspiration. Time to be empowered on this beautiful, precious planet we share, because all willing humans have been invited to the biggest, brightest evolution we have ever known. Let’s evolve. Let’s bloom with the peace, prosperity, & perfection already in all of our cells. Since our generous Spiritfamily has talked up this overnight evolution constantly, we focus our Spirit listening on transformative tools because sometimes we just need a boost to fulfill our core destiny: to embody our innate, true perfection. These Sets are utterly healing. They ask us to name— to truthfully embrace—the challenges of being human so unconditionally with our innate perfection that we evolve. HUZZAH!!! After we have Acted on Evolution with the Earth and received those gifts, we can gleefully align with the Magical Beasts & Totems that have always been here looking for willing, transforming humans to work and play with miraculously. These Sets bring out the Magi in all of us: Let it beam from your chakras, your intents, your joy. NOTE: Some of these Wands, below, are also in the Earth Peace Warrior Set, like the Dragon Wands (Who could ever have too many Dragons??). For instance, in the Earth Peace Warrior Set, the Dragon Wand connects us to the Earth first & foremost. In the Magical Beasts & Totem Set, the Dragon Wand aligns us with our own unique, magical Destinies to heal our issues so we revel in the fun we then can co-create from that glory! Firstly, YOU are the Magi. Listen to the Stones in these Wands, as they have been listened to from conception, to naming, to manifestation in your hands; they are used to it and are just waiting for you to ask them for their gifts. Now. Think you can’t hear the Stonebeings? Learning the language of Stone Wands just requires practice. Want some tips? Why didn’t you say so? Talk with them daily. Listen intently. Watch for signs of their answers. Keep a Magical Wands Conversation Log to record the everyday miracles unfolding. Create positive, powerful Intents (they can only be about you, to be respectful). 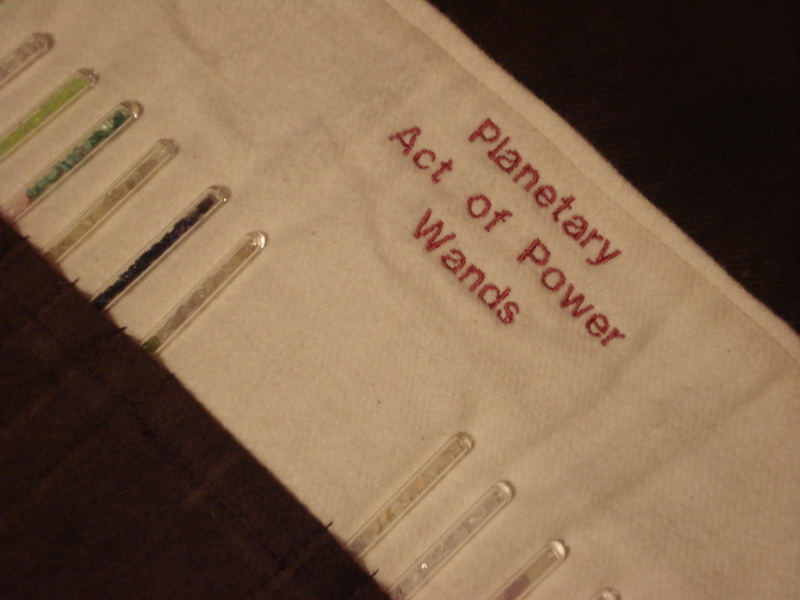 Lay your Wands on them until you co-create them together. Wave them (gently!) in the air during Mantras, Sacred Song & Dance and Fun that you want to expand always. Charge up your food, drink, supplements, crystals, magical tools by placing your Wands near them and announcing your life-affirming intents. Thanks for sharing the magic with us.